Iranian officials say more than 400 people are dead after a powerful earthquake struck along the country’s border with Iraq Sunday night. A spokesman for Iran’s crisis management headquarters spoke to reporters on Monday. He said that about 6,700 people were injured in the earthquake. Reports say the worst damage appeared to be in Iran’s western province of Kermanshah. This satellite map shows the area affected by the earthquake. The quake also is believed to have damaged a dam on the Diyala River in Iraq. The dam’s director told the AP that the dam was built in 1961. He said it was very strong, but had very clear damage. 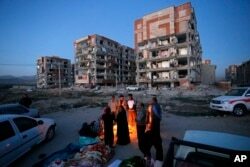 In this photo provided by the Iranian Students News Agency, ISNA, survivors of the earthquake warm themselves in front of destroyed buildings at the city of Sarpol-e-Zahab in western Iran, Monday, Nov. 13, 2017. Mario Ritter adapted his report for Learning English with information from VOA, the Associated Press, and Reuters news agencies. George Grow was the editor.